Manager Yusef Demir is the friendly face of the market, but because the rest of the staff may not be used to American customers, the language barrier can be problematic if your questions are complicated. That said, it's still well worth a visit. Park in front of the store, which is actually in part of a huge old brick warehouse turned marketplace. Inside, you'll find a butcher shop, a fishmonger, an olive and appetizer bar, a dairy department, a feta cheese section and aisles of grocery items straight from Turkey. 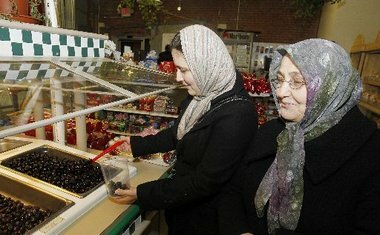 There are 15 varieties of olives ($3.99 to $5.99 per pound), cornichons ($2.99 per pound), pickled vegetables, chilis and a good selection of salads, spreads and dips ($4.99 to $5.99 per pound), including hummus, baba ghanoush, labne (thick, strained yogurt) and stuffed grape leaves. If you like baklava, there are 18 kinds, all from Turkey ($6.99 to $9.99 per pound), including one that comes in an 18-inch pastry string filled with pistachios. For feta lovers, there are eight types ($2.99 to $7.99 per pound) from France, Bulgaria, Greece and Turkey. The Turkish version is dense and hard, not creamy at all, and on the mild side. There are sales every week, so ask for the flier. The prices are already low, so a few of the sale items made our purchases real bargains. Deals at regular prices include large dried apricots for $2.99 for 5 ounces, a liter of first, cold-pressed extra virgin olive oil at $6.99, and 34-ounce jars of stuffed grape leaves at $3.99. Quarts of apricot or mango nectar are $1.50, and preserves in a dozen flavors such as fig, quince, orange peel and grapefruit/orange are $3.49 to $4.99 per 1.76-pound jar. Honey is another good buy at 5 pounds for $14.99. For fun, check out Turkish ketchup and mayonnaise for way less than we're used to paying for national brands. Jars of grilled eggplant are $3.65 for 23 ounces, 5 pounds of pickled chilies are $11.99, and if you can't find a herring you're looking for at Istanbul, I don't know where to send you. Take time to go through the shelves and you'll find some treasures. How about 29-ounce cans of white, kidney or red beans for $1.99? Pasta in all shapes and sizes are 65 cents to 75 cents per pound, and bulgur, orzo, lentils and rice average $1.59 per 2-pound bag. If you like Turkish coffee, it's here for $5.99 per 25-ounce bag. There isn't enough space to go through all the cookies, biscuits and snacks, but it's really a hoot to look at the Turkish versions of Chips Ahoy and animal crackers. Demir wanted me to mention Omak ($3.49 for 8 ounces; $6.75 for 16 ounces). It's a bottle of layered pistachios, macadamias, almonds, figs, coconut, hazelnuts, caraway seeds and almonds; each one looks like art. "Omak is for everyone who wants to be young with a strong mind and every old man who dreams to have his youth back," he says. Once I heard that, I bought a few jars to give as gifts. Spices are also ridiculously low-priced. Whole cloves are $2.99 per 8-ounce jar, or you can buy the same amount of ground cumin for $3.75. In the butcher shop, pick up skinless and boneless chicken breasts for $2.99 per pound, rib eyes for $6.99 per pound or lamb chops for $7.49 per pound. Fresh fish of the day, like sea bass or dorado at $6.99 per pound, is filleted and cut to your taste at no extra charge. You'll probably be really hungry when you finish shopping and leave the store, so I recommend a stop at the fresh foods bar for a few lentil and bulgur bites ($3.99 per pound) to eat on the way home. Seasoned perfectly with just the right amount of kick, these make great munchies or appetizers for guests who enjoy something a little different. Istanbul Food Bazaar is not a particularly large store, but it's filled with a wide selection of good food at good prices. It's a great place to go slow and explore, and if you do, shopping can be a true treasure hunt. While you're in the neighborhood, have lunch at Toros, 489 Hazel St., Clifton, (973) 772-8032) -- it's the best -- or go to Taskin Bakery nearby, 103 Hazel St., (973) 278-9555, where thick, delicious flatbread called pide comes right out of the ovens all day and night long.